You could be blessed with an S-Class or be faithful to your Splendor. One way or another, though, you absolutely need an urban runabout, a decent highway performer, one that is economical, easy to park, and something that anyone in the household can drive. So allow me, please, to help you with your next big (or small) buy. 1. WHICH IS BETTER EYE CANDY? 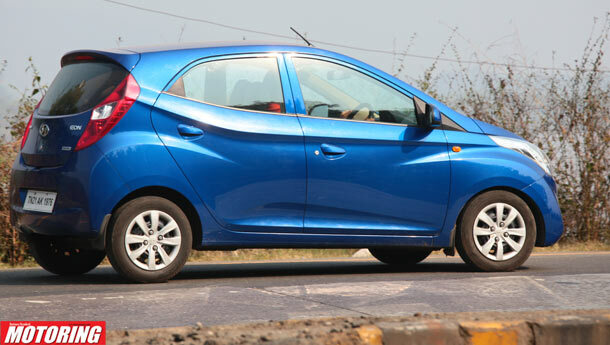 The Eon looks like the more sophisticated hatch of the two, but it’s not exactly cute or pretty. 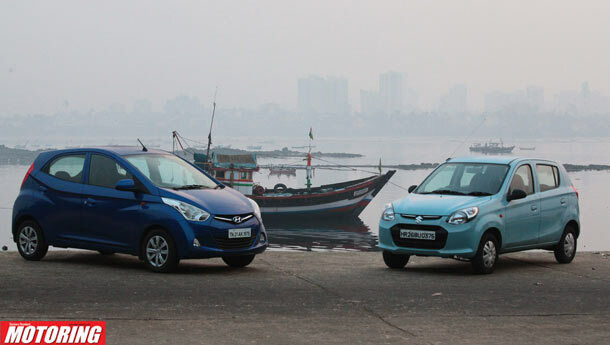 Set against the Mumbai skyline, it looks like a well-meaning compact hatch, not a handcart with a motor, and neither member of your household will be embarrassed to be seen in one.The new Alto 800 looks a bit quirky cool, especially in that Kelvinator Blue (that’s not what it says in the brochure!). 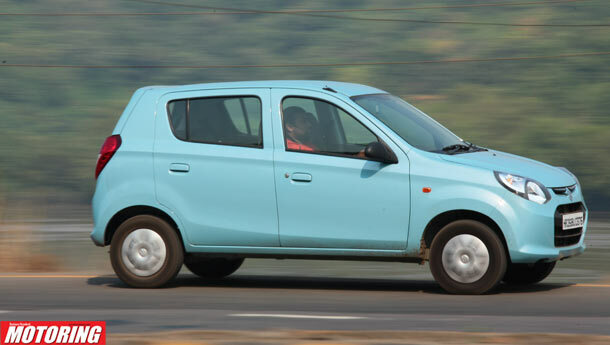 Although that sense of novelty and ‘cool’ will be lost by the time you read this, given that Maruti Suzuki would have sold fourteen thousand units of this Alto as well by then. Still, there are a few interesting elements on the Alto’s exterior – a Swift-esque greenhouse, substantial clear-lens headlamps and a blink-and-miss bulge on the bootlid. I’d buy one in Buttercup Yellow. Unless you buy one next month. 2. CHEAP TO BUY, YES, BUT WHICH IS NICER ON THE INSIDE? 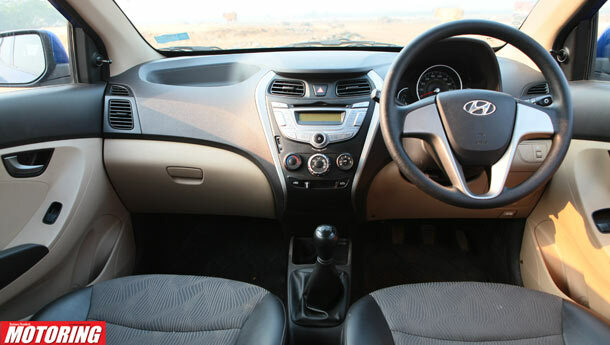 The Eon’s interiors are as swanky as an entry-level Samsung smartphone and feel just as good to the touch, too. 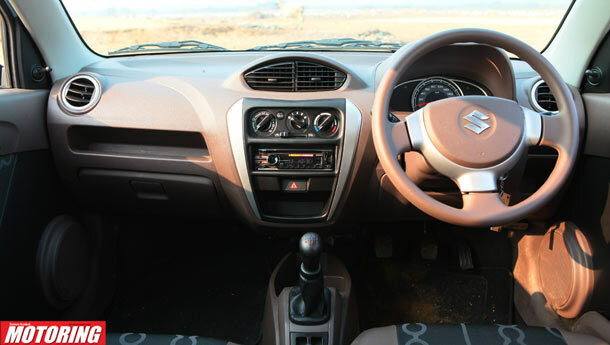 The dash is well laid out, the two-tone door panels, with storage pockets (for the front row only) look premium and anyone who’s hung around the small car market since the days of the Maruti 800 will definitely be very impressed. The Alto looks quite decent on the inside and it is a remarkable improvement over the Altos that have been. The dash has a slim scoop (no top-loading space here) above the glovebox, for cellphones and dust, I suppose, and there’s a single door pocket on the driver’s side. Given that there is only so much physical room for improvement on what is a decade old platform, Maruti has done a pretty good job of the Alto’s insides. However, on a purely value-for-money basis, the Eon wins this round. Unless you like grey and you actually own an S-Class. 3. FIVE ADULTS? GOA? SERIOUSLY? No, just kidding. At a pinch, you could pile in four adults and a kid in either car and make it halfway to Goa before the arguments set in. Having said that, the Eon has that slight edge in terms of shoulder and headroom, with the former aspect being the Alto’s weak point. The seats in the Eon are more supportive than those in the Alto and given that you sit taller, there’s an increased sense of space. With the Alto, Maruti Suzuki has completely pushed the limit of space management – the front seats are scooped to the last bit to make way for knee room – although in comparison to the Eon, it feels like exactly what it is – small. Bring back cashew feni, please? 5. WHAT WILL YOUR NEIGHBOURS THINK OF YOUR CAR? If you park either next to your S-Class, your neighbours might think you’re trying to dodge tax men. Both will, however, complement your Splendor rather well. If you’re a college going lad, chicks will fall for the Eon over the Alto, given that they can’t tell the difference between a Ford Figo and an Alfa Romeo 147. Either way, your neighbours will be thankful you didn’t buy a used Gypsy with an aftermarket can. 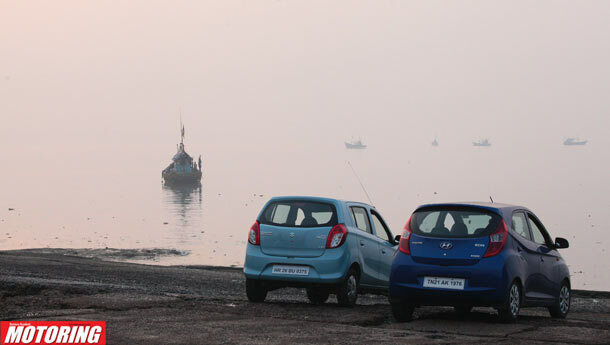 When the ‘average kitna hai?’ question pops up, tell them 18 kpl overall for the Alto and 16.5 kpl for the Eon. They’ll be impressed. 7. WHICH WILL THE WOMAN/GRANDPA (err, sorry!) LIKE TO DRIVE? No offence to women (or to senior citizens) – it’s just that both like ease of getting in and out, outward visibility and light controls. The Alto scores higher on the last two out of three counts – it really is pretty, well, car-like to drive around and if you find the Alto intimidating, you shouldn’t be allowed to drive! The Eon, being taller, makes light work of getting in and out, even more so at the rear, although that large-ish dashboard and marginally thicker pillars all-round means shorter drivers will step through traffic a bit cautiously. So it’s the Alto for the wife and the grandparents, then.Buy Kelvinator blue, okay? Because looking out of a car is more important than looking at a car. 9. WHICH IS SAFER, FEATURES-WISE? While a driver-only airbag can be journalistically nitpicked upon,it’s at least better than having no such option at all! So a point each to the Eon and the Alto for offering an airbag in the top-end variants although I wish both would also offer ABS (even if as an option) since if you could brake in time, the eventuality of you crashing into something and requiring an airbag would be overruled anyway. That said, given that the Eon is designed in the times of today, it is naturally more crash-worthy, or at least that’s what those chunky pillars suggest! Can’t put a number on it, since none of us are dummy enough. 10. NO BI-TURBO V8?! FINE, BUT WHICH IS MORE F-T-D? Alright, the Alto and the Eon won four rounds each, while they tied on round 4 and 5. As a result, picking one is now a personal affair. Since I like shirts, crew-cuts and use a BlackBerry, I like the Alto. But since not everyone is as boring and since most of you have discovered music other than Pink Floyd, you might find the Eon better. You’ll be just fine with either car, so long as you have a thing for Kelvinator blue or Gangnam Style.